Vermont Quilt Festival - a most excellent adventure! We (46 of us) boarded the bus at 8:00 a.m. and headed out for a most wonderful adventure! There were only two minor glitches, both of which ended up on the positive side. 1) We had to divert our trip slightly to pick up another bus as our toilet was not functioning. We ended up with a newer, more comfortable model! and 2) we ran into construction/accident traffic which forced us to seek an alternate route through Vermont's beautiful countryside. We still landed in Essex Junction in plenty of time to shop at Yankee Pride Quilt shop. We then headed over to the hotel to check in and get ready for the Gala Champagne preview. We entered the venue through the "prepaid" entrance which is where all the "special" exhibits were. The first thing I saw was the magnificent collection of quilts from Deb Grana and Sharon Waddell. It was without a doubt the best exhibition of antique quilts I ever seen at a quilt show. Both Sharon and Deb are very gracious about sharing their collection. I was of course mesmerized for an hour or so. Finally, a friend broke the spell by asking me where my quilt was displayed. Wow, I forgot all about it. We headed into the main hall to look for it. I was so surprised to see a red ribbon attached! But, it also had a little gold safety pin on it and I couldn't figure out why until another friend came by and asked me why I wasn't at the awards ceremony, and "didn't you hear your name called?" Long story short, I was also "honored" with a judge's Choice ribbon from Sue Nickels. 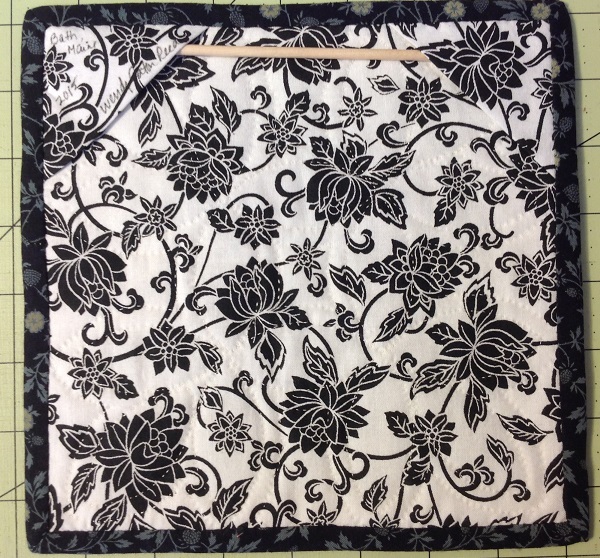 I feel particularly honored since I consider Sue to be one of the greatest "machine queens" of the quilt world and for her to choose my all hand appliqued and hand quilted potholder method quilt, I was speechless! (and for those of you who know me, I am rarely speechless!) I'm sorry to say that I failed to get permission to post any of the contest quilt photos I took. Deb and Sharon however are happy to have us share their quilts with those of us who appreciate them. Thank you Deb and Sharon!! Here are a few of my favorites. I'm not going to caption them so if you have any questions, please let me know and I will give you the information that was published in the show booklet. and a super fun "Trip Around the World"
here is a close up - look at that fussy cutting! another favorite - these stars were amazing! This was my favorite and when I asked Deb for permission to reproduce it, she said "by all means, but I think you are crazy!" We'll see! just look at those grapes and tendrils and piping! I don't think I will do the conventional red & green. 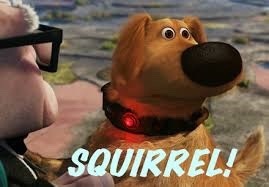 Hmmm, maybe cheddar? That's all for now. I will post more later. If you ever get a chance to meet either of these fine collectors, do let them know how much we appreciate their custodianship! They are both members of AQSG and I think they are both planning on being at this year's seminar in Indiana. I came home from the Vermont Quilt Show (I will post photos and stories when I get more time) to find this lovely little gem on my doorstep. My swap partner in Lori's small quilt swap was Frances from the UK (Fabadshery). She sent me an adorable quilt and a nice note saying that she didn't have as many reproduction fabrics as she thought she did. So, I sent her a set of 5" squares from my (overflowing) collection. And, she in turn made this little beauty to help me "celebrate" our upcoming 4th of July. Thank you Frances! I love Blogging! I want to share some photos of our annual "Seven Sisters" retreat this past weekend. I feel so fortunate to have these 6 women in my life. We all have different quilting styles and tastes which fit perfectly together in one fun filled weekend. 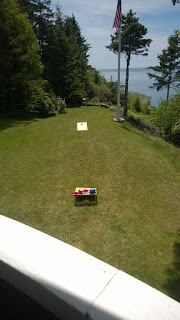 This is our 4th time in this wonderful place, the Quilt Inn (check it out here) in Rangeley, Maine. The Inn is run by Carol and Dan Perkins who also own the Threads Galore quilt shop next door. I can't say enough about this wonderful location and facility. 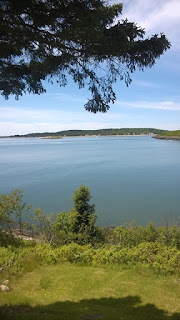 All I can say is if you are even thinking about a retreat in the Northeast, you MUST consider this wonderful place. Dan and Carol are open for their guests at "any" time during your stay. I know, doesn't that sound dangerous! You can get a good idea of the superb quilting room from my photos, but to see the bedrooms visit their site (here). Quilts on every bed! 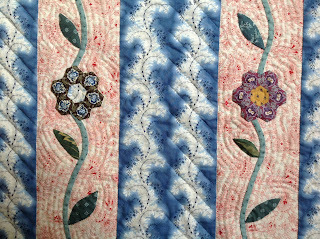 And, you can visit Dan's beautiful gardens and if you are lucky, you can get a sneak peak of the current (always award winning) quilt they are working on. Just a wonderful experience. O.k. Here are a few highlights of the weekend. 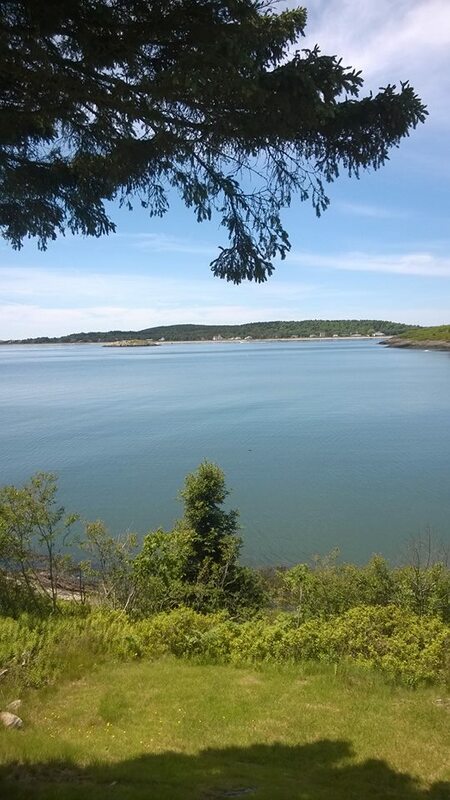 don't we all wish we had this view from our grocery store parking lot? so, we are all in and starting to stitch 'til we drop. The two Karen's rev up their machines. Tina, Fotini and Kathy hard at work with Charlotte guarding her station in the background. 4 of us are following Barbara Brackman's Stars in a Time Warp. These are Karen M's stars. These are Charlotte's. Don't you love the 9-patches in some of the centers? and these are Tina's. Unfortunately, you can't see the ones on the board behind her. She is like a mad woman with these things! I also think she may be in second place for the amount of projects she brought (and WORKED on)! We had some late night sewing and apparently some late night mischief as well. When I woke up on Saturday morning we all had these wonderful little fabric bowls at our places. Charlotte and the elves had been working until 3:00 in the morning to complete them by morning! Wow! Months ago, as a joke, I had given Charlotte a bag of the trimming from when I square up my fabrics. She is always making something from nothing so I said, ha make something form this if you will, and lo and behold, she made the fabric rope from them and then these wonderful basket bowls. Amazing! She stitched so late into the morning that she misplaced her nightgown. She found it hanging by her place in the morning. Oh, those helpful elves! Some late night stitching was not as successful as others. Kathy just didn't know when to stop so she just turned it into a "Y-patch"
Karen M whipped up a few small quilts. Aren't they beautiful? Fotini is making this spectacular quilt for her 18th century bedroom. luscious! Karen B is busy cutting while Tina stitches and Fotini turns up the tunes. as for me, I was the only one who didn't bring my machine! I brought my new potholder quilt and that was it. My goal was to get all the leaves basted to the background and by some miracle I made it! I still have a long way to go but I'm liking it so far. So, I hope you all get a chance to visit this wonderful place. 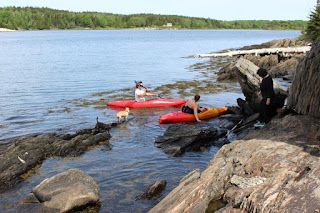 With all we accomplished we still found time for chatting and eating and swimming in the lake (I'll spare you those photos - ice out was only 3 weeks ago and it was a bit chilly to say the least!). Enjoy your quilting adventure today. 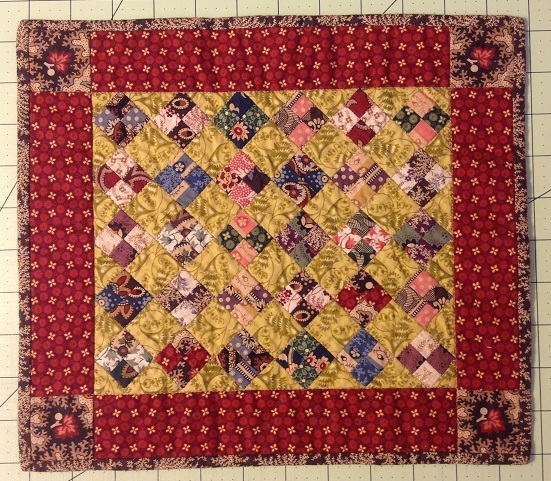 It is a mystery how someone who quilts a little every day, can only seem to post once a week! I'll never make it in the Facebook world where people seem to post every hour. Anyway, my daughter and I have plans away next weekend so we had an early Father's Day celebration this weekend. I didn't get a lot of quilting done but I was able to finish my AQSG 1825 challenge quilt. I will show just a part of it since I haven't really entered it yet. 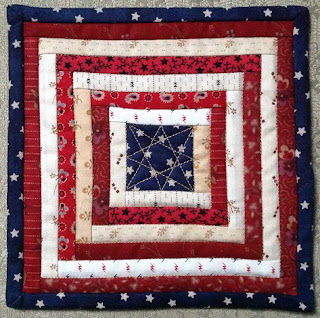 If you are not familiar with the American Quilt Study Group, I recommend you go to their website (here) and look around. It is a must for anyone interested in quilts and quilt history. I was fortunate enough to have served on the board in the late 1980's and early 1990's and met some fantastic people who share the same passion for history that I do. 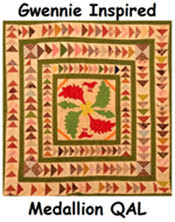 They have a seminar ever Fall full of wonderful things pertaining to quilt history and research. 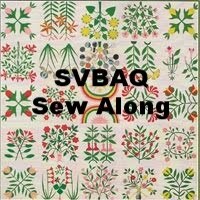 This is where authors present their research on a particular part of quilt history which is published in Uncoverings (a must have every year) and distributed to members. It is well worth the annual dues just to receive the annual Uncoverings! and, this is why I didn't get a lot of quilting done. What a fantastic weekend with our kiddos! 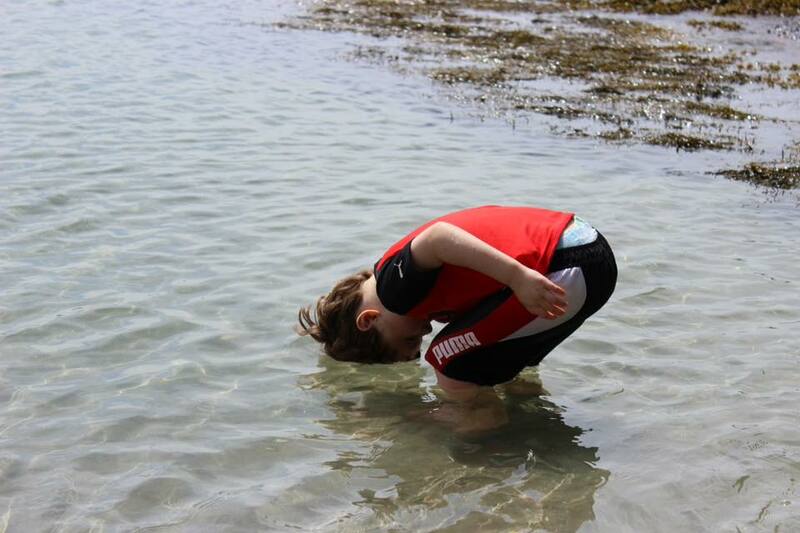 Our grandson will do anything to just be in the water. It was way too cold for Nana! The big boys got in on the act of relaxation too. 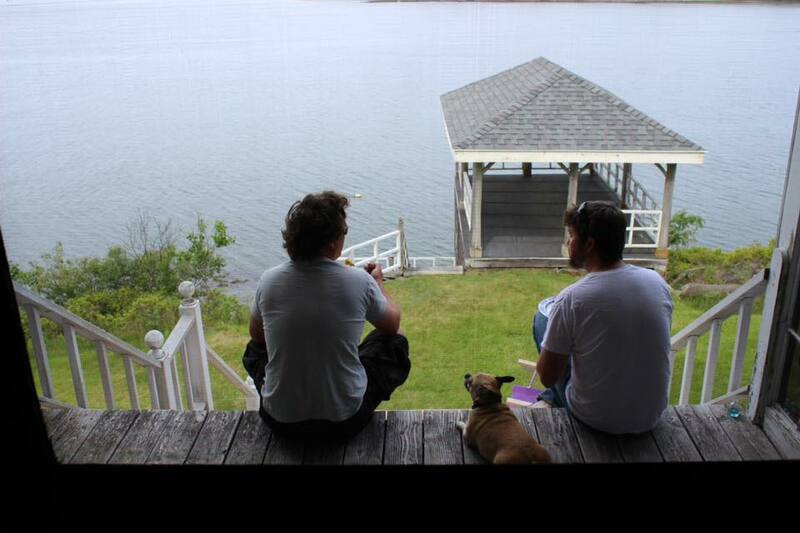 My son in law and my son with miss Loa Bella in the middle. 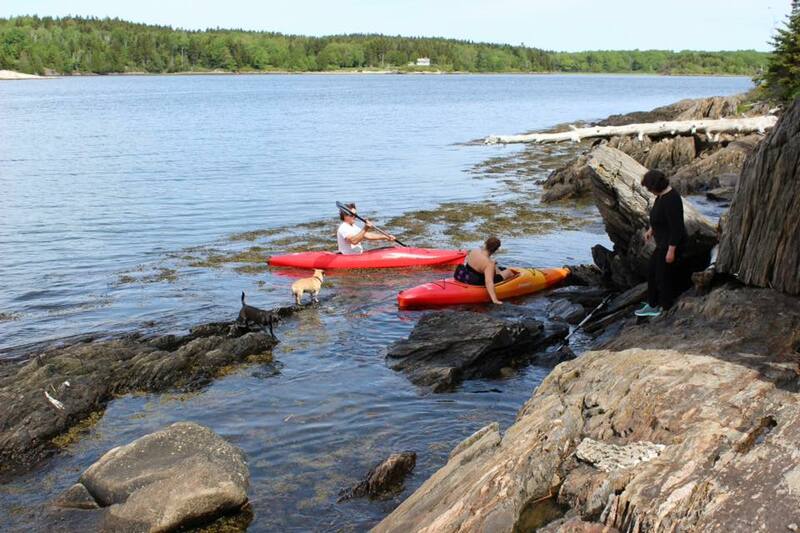 or paddled about in the kayaks. We know how very fortunate we are to have this place to go to when life's stresses become too great. I never take my machine, but I do take hand sewing to work on until the sun goes down. Life's Reflections and donation quilts. 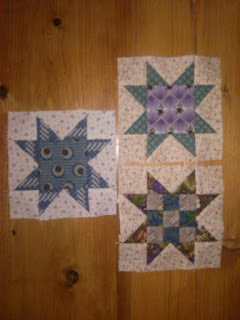 I didn't get much quilting done this weekend. I spent all day Saturday at the funeral of my mother's cousin. My sisters were unavailable, and there was no question that my mother had to attend, so I knew I would be the one to take her down. I had been dreading the drive through Boston and beyond, I am NOT a city driver. So, my wonderful husband offered to do the driving and away we went. 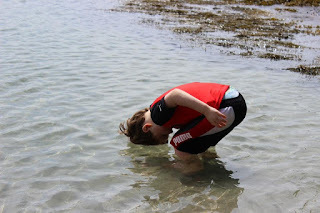 The reason for this story is to remind myself (and anyone out there who can relate) to be flexible because life doesn't always go as planned. 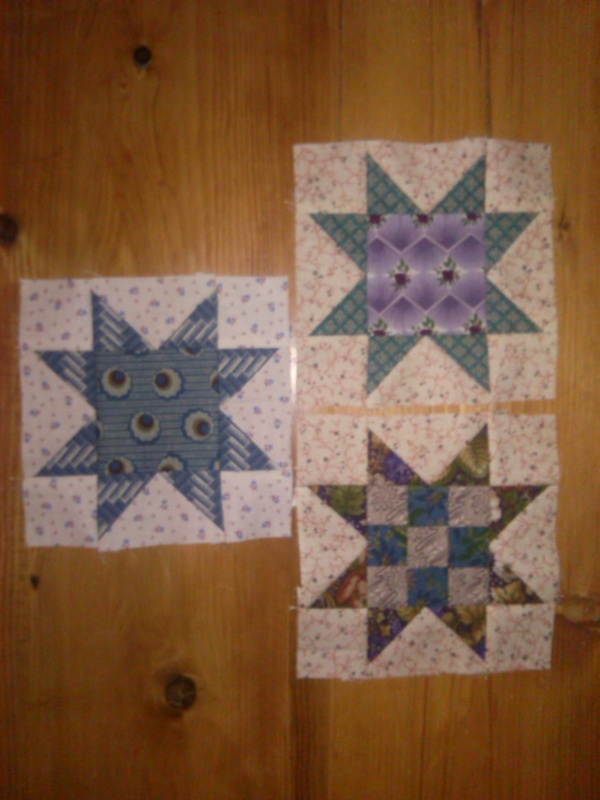 All I wanted to do on Saturday was to sit in my sewing room and quilt. When this "interruption" happened I was fuming at the thought of riding 6 hours in the car and listening to relatives that I hadn't seen in over 30 years reflect about their lives. Oh how wrong I was! It was a lovely service. My mother (who wouldn't say her own name in public when I was growing up) got up and spoke about her favorite cousin. I learned so much about my mother and her childhood that day. I listened and laughed and cried and was actually sorry when it came time to leave. So, enjoy the little things in life and try to relax when interruptions happen. So, since I made very little quilt progress I will share a few quilts I am donating to our auction at this summer's quilt show. 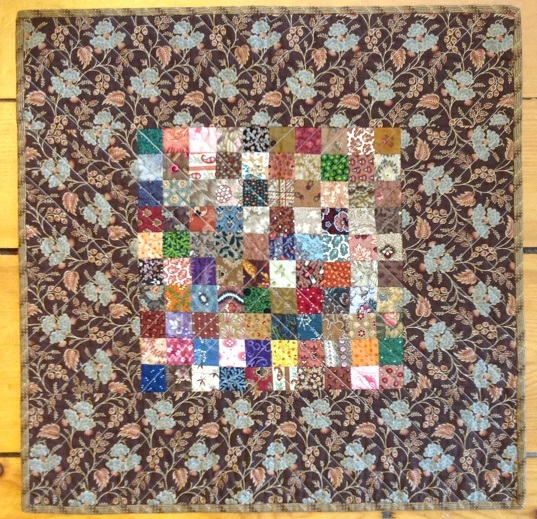 This first one is 8" square and is actually a "reject" from one of last "potholder" quilts. It was rejected because I decided to change the backing. So I put a triangle sleeve (as taught to me by Cyndi of Busy Thimble) on it and it will go to the auction. 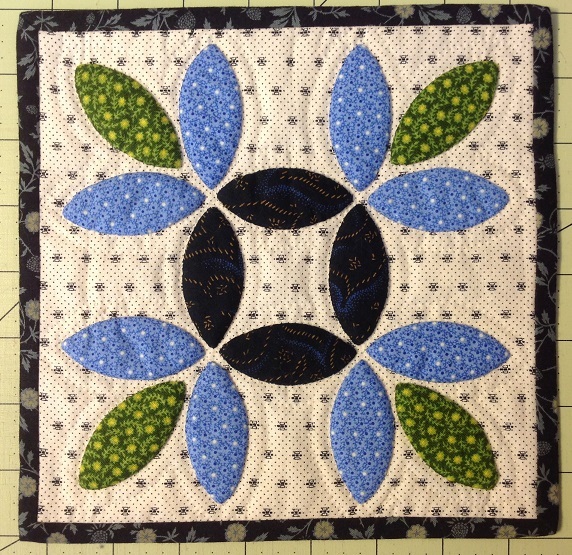 This is one of the many little 4-patch quilts I like to make for donations. They are relatively quick to make and they don't take up a lot of space so people like to bid on them. 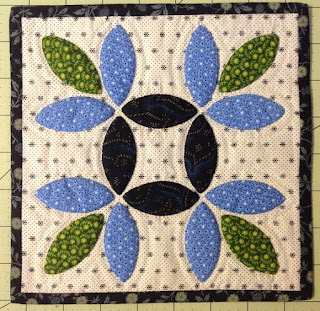 And this is just a charm scrap quilt (my favorite to make) with a wide border for a medallion look. I love the backing fabric on this one. It is a Judie Rothermel reproduction from about 10 years ago. And I don't think I have shared my friend Charlotte's Time Warp stars. I now have 3 non blogging friends who are Time Warping! They are keeping me on track! So, Happy Quilting and go with the flow. 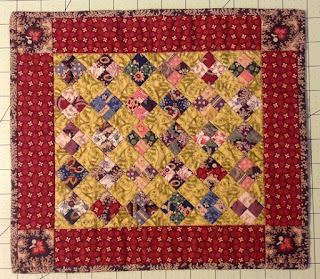 My little swap quilt arrived safely at the new home of Sharon in Washington state. She sent a wonderful note saying how much she liked it and I'm thrilled. So here it is. It is a charm medallion style. There are 130 different prints including the binding. 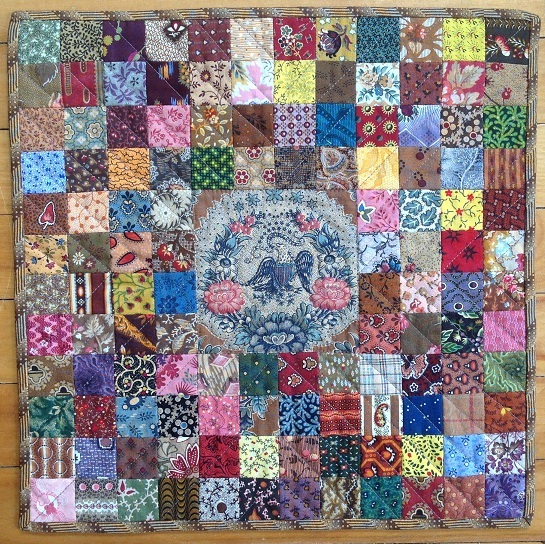 The eagle in the center is hand quilted and then the outer part is machine quilted. So many people have asked me about this little quilt that I think I might make up some kits for people to make there own. Heaven knows I have enough scraps! Enjoy the day. 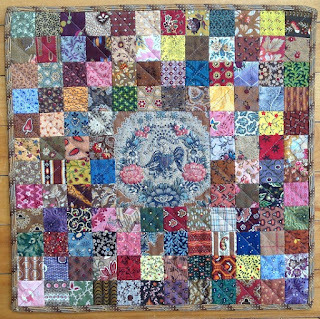 I wish I could claim this for myself, but I am posting the most magnificent quilt made by my friend Karen (I must get her to start Blogging!). 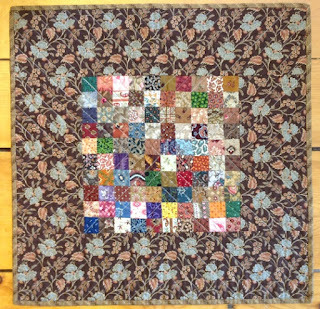 She took a workshop last summer with Pat Sloan and this is the fantastic quilt she made. I forgot to ask her what she named it but it will be at our state show in Augusta, Maine this summer. 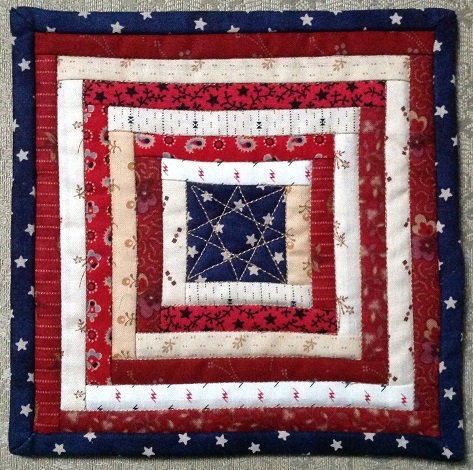 It was beautifully quilted by Marsha O'Donell from Albion, Maine. the pictures do not do it justice, but you can get the idea of how beautiful it is. It starts at the upper left with Winter and I think that this Spring block is my favorite. Or maybe Summer, or maybe Fall, or maybe Winter!